ASCII Art Generator is an amazing graphics art to text art solution, which allows you to convert digital pictures into full color text-based images easily and quickly. You can input any message you'd like, and let your picture say what you want it to read. 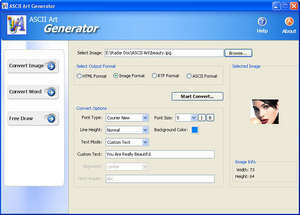 It supports gif, jpg, bmp files, and generates four popular formats, including html, image, rtf and ASCII. Make your pictures eye-catching with a very cool texture, made of letters and digits. ASCII Art Generator 3.2.4.6 is a shareware program and can be used as a demo to try the software until the free trial period has ended. A full version of the program is available after the trial period ends. For security reasons, you should also check out the ASCII Art Generator download at LO4D.com which includes virus and malware tests. Additional screenshots of this application download may be available, too. 3.2 out of 5 based on 12 ratings. ASCII Art Generator has a presence on social networks.